A recipe for Chocolate Streusel Bars. 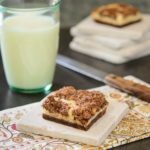 The bars have a chocolate base covered with a layer of sweetened cream cheese and a chocolate pecan streusel topping. Add flour, sugar, cocoa, and salt to the bowl of a food processor fitted with a knife blade. Pulse to combine. Add the diced butter. Pulse until it resembles coarse crumbs (mixture will be dry). Reserve 2 cups of the crumb mixture in a bowl to be used for the topping. Pour the remaining crumb mixture into a 9- X 13-inch baking pan, spread evenly, and firmly press down. Bake the crust for 15 minutes. Beat cream cheese until fluffy. Add condensed milk, egg, and vanilla. Beat until smooth. Pour over warm baked crust. Stir pecans into the reserved crumb mixture. Sprinkle evenly over cream cheese mixture. Return the pan to the oven and bake 25 minutes or until bubbly. Cool completely on a wire rack then refrigerate for at least 2 hours. Slice into bars or squares. Store covered in the refrigerator. Time stated does not include time for chilling before slicing into bars.